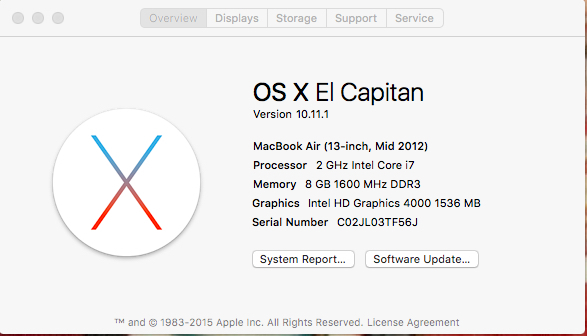 Well, my Macbook Air is now upgraded for a couple weeks now to El Capitan and doing well. That was a 6GB file btw! I just picked up a used 2009 Mini with snow leopard and updated it to El Capitan over the weekend. That is a huge file. I saved it and made a bootable usb thumb drive in case I need to (re)install it again. The funny thing is it does not seem that different than my experience with my 2001 iMac. While Windows has been frustrating me with major changes in the user interface, moving things around, and confusing me so badly I get lost looking for things, the Apple OS looks like they simply added a few new things to the same old interface. It's so familiar. Fourteen years and the steering wheel, gear shift, brakes, and accelerator are in the same place. It's so easy to drive when the controls are in familiar places.